In picking up from where we left off in our prior post, Smart Meters: Should We Be Concerned?, this leads us to the issue of dirty power derived from smart meters as reported by engineers in Northern California. These include harmonic multiples of 60 Hz (Hz/hertz: a unit of frequency defined as the number of cycles per second), ranging anywhere from 4,000 to 100,000 Hz; causing short, sharp bursts of frequencies that leak into a room from electric circuits and plastic AC (alternating current) power cords plugged into outlets. Dirty power comes from many sources and, in terms of smart meters, it is reportedly due to what is known as the switched mode power supply; a chip-based transformer that steps 120 volts down to between 2 and 10 volts needed to run the circuit boards in the digital smart meter. The problem is that these frequencies negatively affect certain people. Dr. Sam Milham writes about this in his book, Dirty Electricity. Smart meter experts claim that all smart meters actually contain filters to block this electronic noise, however, there is a growing consensus that these filters are not equally effective. How well they work seems to vary from one brand of smart meter to another. This could explain why some people in Northern California report becoming symptomatic from smart meters even before the communication module is turned on; meaning, the RF (radio frequency) is not yet switched on yet, some people react to the smart meter. Spikes on oscilloscopes are detected in circuits in many homes by these engineers and attributed to the smart meters. However, the same spikes are not being found when circuits are analyzed in homes in other parts of California where different brands of smart meter are used. 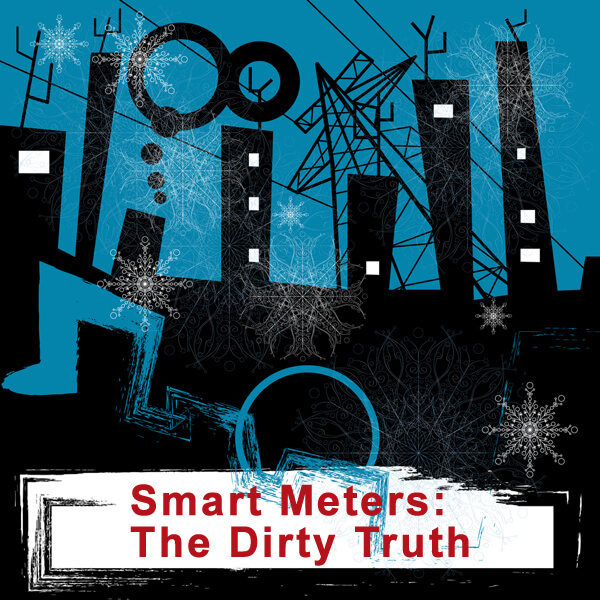 We, therefore, cannot conclude that dirty power is a universal problem with all smart meters. Currently, we are launching a study in the Building Biology® profession to see just how widespread this particular problem is throughout the US and Canada. You can keep abreast of ongoing results from my own smart meter study HERE. As with all wireless devices, there is a range of how different people react, from zero effect to being severely impaired. If you are EMF sensitive, you should choose to opt out from the installation of a smart meter. If you reside outside of California and your utility does not offer an opt-out program, I recommend you join efforts to mandate one through your state’s public utilities commission as was achieved in California. If you are not EMF sensitive or symptomatic, but are health conscious and want to avoid any potential problem from your smart meter, then you should also opt out and support opt out efforts in your area. If such a program is not yet available where you are, or if you have opted out but are still bothered by RF that comes into your home from other smart meters in your neighborhood, there are successful shielding strategies that you can employ. They can be expensive, but they do work. See the shielding section of my smart meter article HERE. My colleagues and I also strongly recommend that you consult a Building Biologist® in your area to reduce and eliminate other sources of EMF in your home that you do have control over. Find a building biologist in your area HERE. Click on the words “State/Nation” to reorganize the table by state versus name. I recommend these strategies above because I have consistently found that those who are the most bothered by wireless devices – particularly smart meters – invariably have other EMF problems in their home that they are unaware of which prevents their body from tolerating RF exposure. We need to find hard-wired alternatives to all wireless technologies and reverse our headlong rush to more wireless deployment. Until that occurs, help yourself tolerate the RF that you are exposed to by eliminating those EMFs that you can control. In general, this requires reducing the use of and increasing distance from all wireless devices, while learning about the other EMFs that surround you (besides radio frequencies). You can learn more at my website, www.createhealthyhomes.com. Thanks to our reader, Melissa for sharing this on our Facebook page! ‘Una St. Clair from Citizens for Safe Technology Society (CST), presenting over 29,000 petitions concerning Smart Meters in BC to John Horgon, NDP energy critic. John presented them to the legislature this past Monday. Other petitions have already been submitted along the way, bringing the total to 35,000.